Cost centre in tally is essentially used to track expenses or costs relating to a purchase, sales or manufacturing in tally. 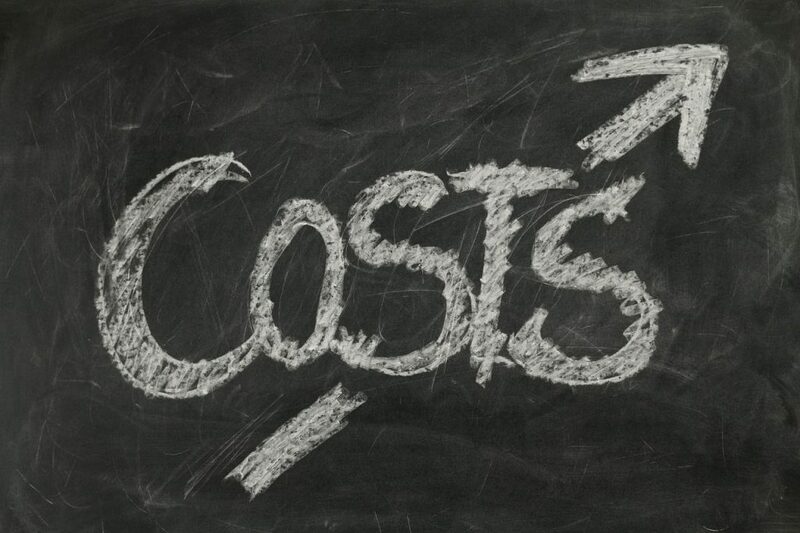 When we say, cost centre, we generally mean where the expenses are being allocated to. For example, there are selling costs of ₹10,000 – but from which area we have spent the money or by whom it was spent is the main question here. That is where cost centres are used and today we are going to learn that in tally in detail. Cost centres & categories for expenses in payment vouchers in tally. Imagine you are running a company about manufacturing t-shirts. There are 2 places from where all the business is done. So, when you are accounting for payroll expenses in tally, you can use the cost centre and select whether the payroll expenses are connected to 1st place or the 2nd place. Similarly, we can select other expenses such as selling expenses and we can see that they are incurred from which place. This will help us find out at which place, more expenses are done. In tally, we can define these places as cost centres. You can also do the similar kind of analysis for different kinds of expenses as well as the incomes or sales and purchases in tally. We will look at it step by step. Here is a step by step way to enable cost centres as well as cost categories in tally. 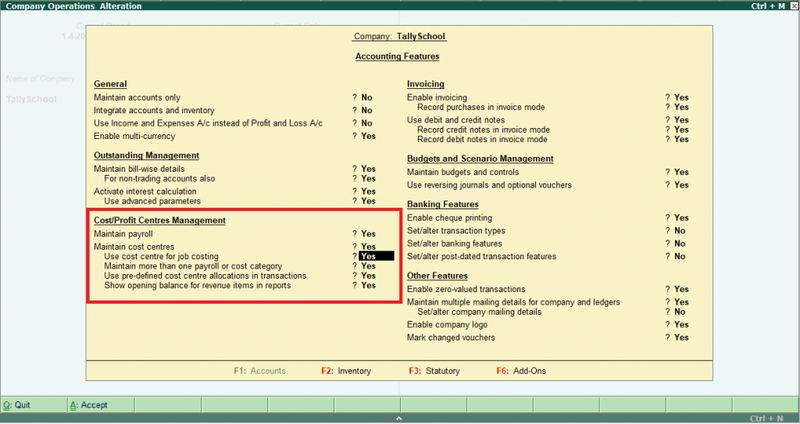 Select Accounting Features – which is one of the features of tally. On the left hand side of the screen, there is an option called Cost/Profit Centres Management. In there, select Yes for both the options of maintaining cost centres and using predefined cost centre allocations in transactions. Press CTRL + A to save the options. Congratulations! You have successfully enabled cost centres in tally. Now, we will go ahead and look at actually creating cost centres and cost categories in tally with examples. Before we actually create the cost centres and categories related to it, we will understand a practical example and then go along with it. You have a company which manufactures T-shirts from 2 different locations. One is in Surat (here I actually live, if you want to meet me) and another one is in Mumbai. Both the locations acts as cost centres. For cost categories, I have created state wise bifurcation. So Gujarat will be the category for Surat and Maharashtra will be the category for Mumbai. At the end of the manufacturing process, we sell 250 T-shirts for ₹5,00,000 to a buyer named Yashaswini who is from Kerala from our Surat location. Along with this, we are also buying some raw materials for making T-shirts to our Surat location from Yash who is from Tamil Nadu. The price of cotton is ₹22,000 per bale and we are going to buy 10 bales of cotton from Yash. Total amount will be ₹2,20,000. These cotton bales will be at our Surat location. On all the transactions 18% GST will be applicable. This example is long because I have covered almost everything about cost centres in tally within this single example. So, now let’s move ahead and see how you can create cost centres and cost categories in tally. First, we will create cost categories because they will be used while we create cost centres in tally. Then, go to Cost Categories. Under the option of Single Cost Category, select Create. In the name option, type Gujarat. Now, you will see 2 options of allocating revenue and non-revenue items. Select Yes for revenue and No for non-revenue option. Save the cost category by pressing Enter. In the similar and exact same way, create another cost category called Maharashtra for our example. This is an exercise for you. Now, we will see, how you can create cost centres in tally. Select the option – Create under Single Cost Centre. 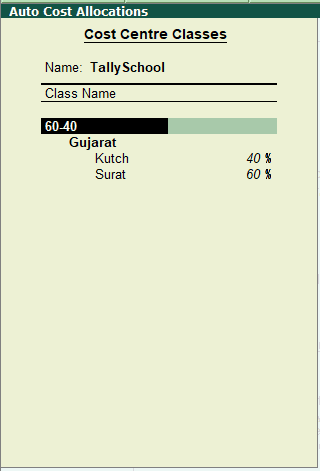 In the first option – category, select Gujarat which we have just created. For the Name option – type Surat. Select Primary for the Under option. 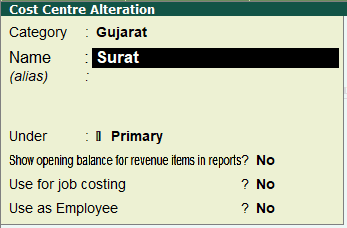 For all the last options of showing opening balance for revenue items in reports and use for job costing & use as employee, select No. Press Enter and save the cost center. Congratulations! You have successfully created a cost centre connected with a cost category in tally. 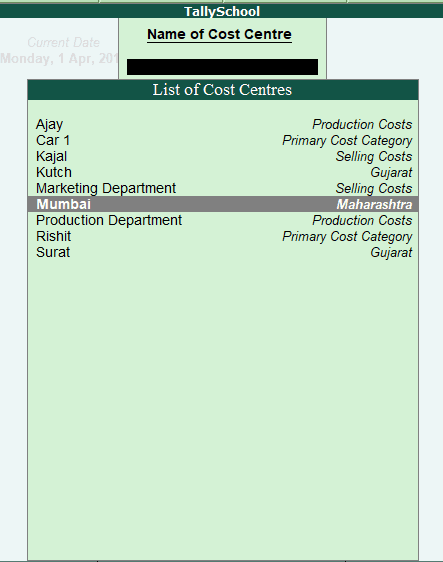 Now, in the similar way, create another cost centre named Mumbai and in there, select the cost category as Maharashtra. Now, we will start with the actual purchases and sales transactions in tally using the above cost centres and cost categories that we have created in tally. Before we start with the transactions, here are few things I have already created in tally that are required for the transaction. Sundry Creditors ledger for Yash – GST configured. Sundry Debtors ledger for Yashaswini – GST configured. Direct Expenses ledgers for payroll expenses and manufacturing expenses. Stock Items for Bales of Cotton and T-Shirts – GST configured. GST Taxation ledgers – CGST, SGST & IGST. Purchase – 18% ledger under Purchase Accounts for purchasing – GST configured. Sales – 18% ledger under Sales Accounts for selling – GST configured. If I will explain how to create the above ledgers, this post will be 10,000 words long. Therefore, instead I have put the links right here to videos and posts of each of the above ledgers. You can go to these links and learn to create each of the ledgers in detail. If you already know how to create the above ledgers and stock items, please ride along with me as we create our purchase entry of cotton bales for manufacturing T-shirts. Select Purchase Voucher from the right hand side green bar or press F9 which is the tally shortcut for selecting purchase voucher. Type 001 in Supplier Invoice No. In the option of Cost Centre/Class – select Surat because we have purchased cotton bales from Yash at our Surat location. For Party A/c Name – select Yash. Now, you have select Cotton for item that we want to purchase. In the yellow coloured Item Allocations screen – select 10 as quantity and ₹2,20,000 as total amount. Select Purchases – 18% as the Purchase ledger in the Accounting Details screen. And, at the end, select IGST as the GST taxation ledger for applying 18% GST on the entire transaction. If you want to provide, you can provide the details for GST e-Way bill in tally here, but right now I am skipping it for the sake of simplicity. Congratulations! You have successfully created a purchase entry in tally with GST using cost centres. Before, we proceed with the sales entry, I have to create a manufacturing entry for converting cotton bales into T-Shirts. It is very easy to create a manufacturing entry in tally and I have already created a post for that. But, I have posted a picture below of Stock Journal Entry for you to see. Stock Journal voucher is an inventory voucher which you can do by going in inventory voucher in tally. Now, that we have 250 T-shirts with us, we are going to sell them to Yashaswini for ₹5,00,000. In Party A/c name – select Yashaswini. In the Name of the Item – select T-Shirt. 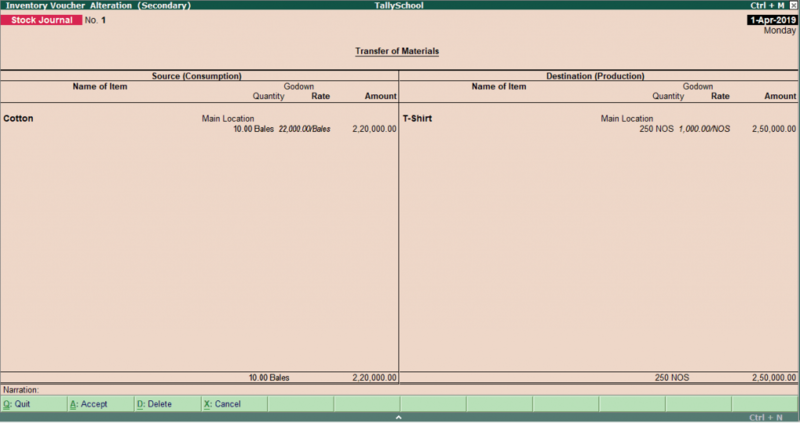 For Item Allocations screen – select 250 as quantity and ₹5,00,000 as total amount. Now, select a Sales – 18% as the sales ledger. At the end, select IGST as the GST ledger to calculate GST automatically. We will not fill up the e-Way bill details here and just select No. Press Enter and save the sales voucher. Congratulations! You have successfully created a GST sales entry using cost centres in tally. Now, 2 more entries are left which are for payroll expenses and manufacturing expenses at different locations. We will do that right now. Now, let me just grab the expenses part of the example so we know how the entry should be done. So, we will pass these entries in tally using cost centres and with GST. Select Payment Voucher from the right hand side or press F5. In the option of Cost Centre/Classes – select Surat. Now, in the voucher select Payroll Expenses and Manufacturing Expenses for the Surat location i.e. 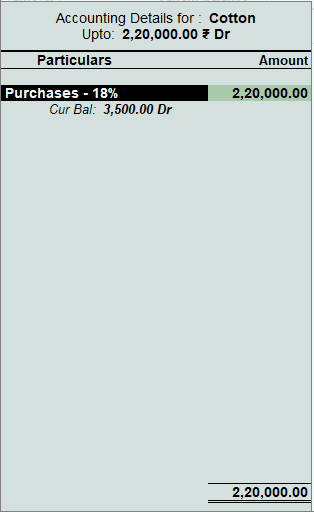 ₹25,000 and ₹50,000 respectively as debit or DR.
And, for Credit or CR – select Cash or bank. Congratulations! You have successfully created a payment voucher for expenses using cost centre in tally. Similarly, for the Mumbai location, you have to do the exact same process of creating an expense voucher using cost centres with the amounts ₹30,000 and ₹60,000 respectively. Now, we will look at using predefined cost centre allocations in tally. Predefined cost centre allocations means that we can define the percentage – % of the allocations that we want to give to our cost centres. For example, if there is another location in Gujarat as Kutch and the manufacturing expenses are 60% in Surat and 40% in Kutch. Note: Please create another cost centre for Kutch so you can continue with this example. We can allocate this in tally to our cost category and the cost centres. This saves a lot of our time because now we do not have to enter the amounts for each of the cost centres in tally. We just have to enter a single amount of let’s say – ₹1,00,000 and tally will allocate the amount for you on the basis of 60% and 40% automatically. But for automatic cost allocation, we have to create a cost centre class in tally. From Gateway of Tally, go to Features and then Accounting Features. 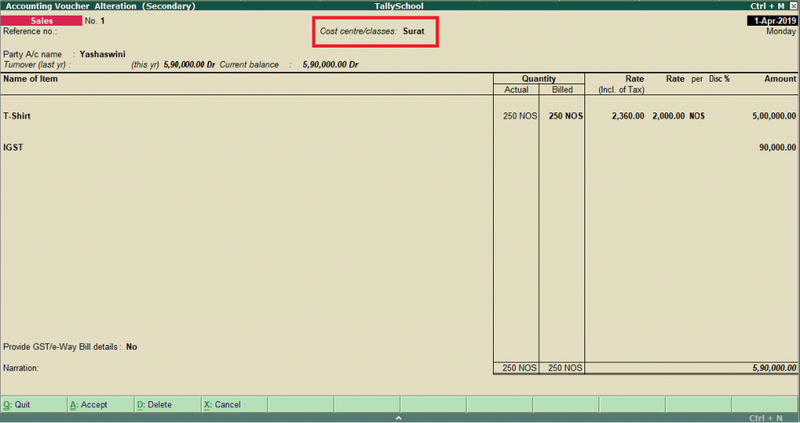 In Accounting Features, go to Predefined Cost Centre Allocations option and select Yes. 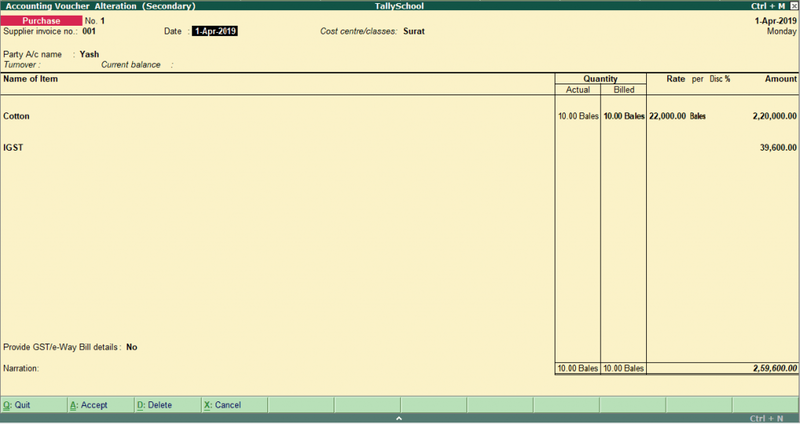 Now, press Enter and you will see Auto Cost Allocations screen in tally. In the Class Name – Type 60-40, so we can know just by looking at the class that it is 60% and 40% allocations. Press Enter and you will see a list of categories. Select Gujarat. Now, you will see Surat and Kutch as the cost centres. For Kutch – take 40% and for Surat – take 60%. Press Enter and you will be in the Accounting Features screen. Now, press CTRL + A here to actually save the cost centre class that we had created. Congratulations! You have successfully created a cost centre class in tally. Now, let’s quickly pass the payment entry for this and see how it works. The process of creating a payment entry will be exactly the same as we have seen in the above in cost centres for expenses in payment vouchers. Just select 60-40 at the top of the voucher in the Cost Centre/Classes option. Pass the entry like a normal payment entry. Now, if you again see the payment entry, you will see that tally has automatically allocated manufacturing expenses to Kutch and Surat as per the ratio that we have set. So, this how the predefined cost centre allocations work in tally. I am sure you have understood it well. It is very easy to delete a cost centre in tally. But before you delete a cost centre or a cost category in tally, you need to know that once you have used them in any voucher, you cannot delete them. This is applicable to each and everything in tally including ledgers, stock items, currencies and so on. Once you have created them and used them somewhere, you cannot delete them. In the above examples, we have created cost centres – Surat and Kutch and we have used them in our entries and vouchers as well. Now, if I want to delete Surat or Kutch, I cannot delete them unless and until I delete all the entries associated with it. Once I delete all the entries associated with Kutch and Surat – cost centres, I can delete them. 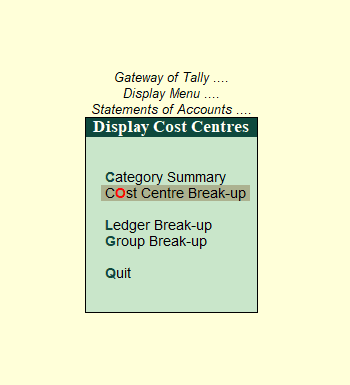 So, how you can delete cost centres or cost categories in tally. Here is how. Select Create under Single Cost Centre. Create a cost centre named XYZ because we are going to delete it anyway. Now, come back to the Cost Centres menu. Go to Alter option under Single Cost Centre and select XYZ. Press ALT + D for deleting the cost centre. You can also press Delete button which you can find at the bottom of the screen on left hand side. You can repeat this process for cost category as well. It is exactly the same. Congratulations! You have successfully learned to delete a cost centre or a cost category in tally. This is a very easy task since we have already created the required cost centres and we have also done entries for it. A very good thing about tally is that any kind of reports are created automatically. You do not have to construct the reports in tally. Cost centre wise reports are very easy to see. Important thing is that how you analyze it and what business decisions do you take on the basis of that. You can also see cost category wise report as well as ledger and group wise breakup by following the steps below. Let’s locate and see the cost centre wise report in tally and find what is in it. Now, select Statements of Accounts. In Statements of Accounts, select Cost Centres. In the Cost Centres option, select Cost Centre Break-up. Now, you will see the list of all the cost centres in tally. From here, you can select different cost centres like Surat, Mumbai or Kutch. Let’s go into Surat because most of the transactions have happened there and see what is in it. So from this cost centre report, we can exactly know what are the expenses and the types of expenses. We can also know the sales and the purchases done at cost centre Surat. In short, we can keep track of all the activity happening in Surat. This is how cost centre wise breakup can help us in taking decisions and to see what is happening at each of the cost centres. Go and look at other cost centre reports and you will find some interesting insights about the business. For me, the only difference between a cost centre and a cost category is that, you can have one more bifurcation or combination. We have created a cost category as Gujarat and a cost centre in it called Surat and Kutch. So, if I look at the cost category – Gujarat, I will have a complete look of what is happening in both Surat and Kutch. Therefore, it is another way of bifurcating information according to the geographic area. That is why, I was saying that the difference between a cost centre and a cost category in tally is just to see information in a different way. You can divide it or you can just combine it in a different way. The videos will be uploaded soon. This post around 3,000 words and if you have read until now, I bow down to your hunger for knowledge. I have tried to keep this post as small as possible but I did not want to skip anything important as well. We have learnt to create cost centres and categories in tally. We have also seen how you can use those cost centres and categories in purchase and sales vouchers in tally. Apart from that, we had also used the cost centres for direct expenses such as payroll and manufacturing in payment vouchers in tally. And, lastly we also saw the reporting of cost centres in tally. I have tried to cover everything about cost centres and categories in tally but if something is left, you can comment down below. If you have any doubts, suggestions or questions, please comment down below and I will be happy to help you.